Fundus images of the right eye (top left panel) and left eye (top right panel) of a 55 year old man with familial exudative vitreoretinopathy. 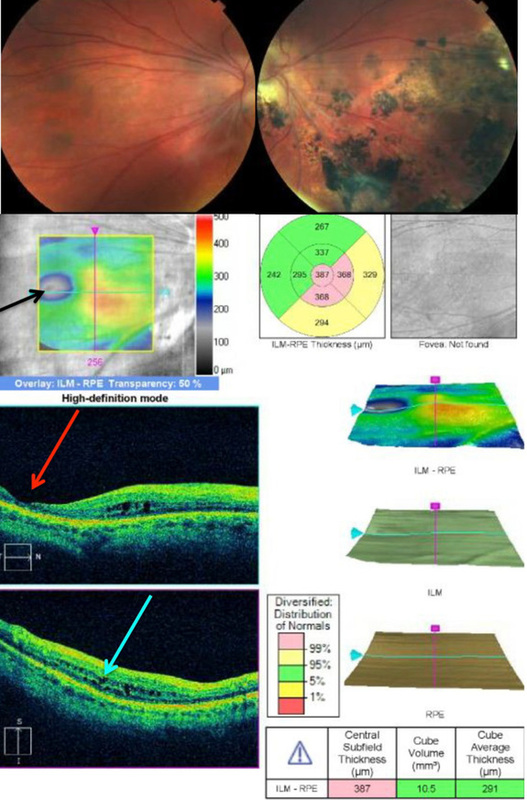 The bottom panel is a spectral domain optical coherence tomography of the right eye of this patient. The fundus images show the dragged, straightened retinal blood vessels. The macula of the left eye has pigmented subretinal scarring, which is common in advanced cases. The OCT image shows that the patient fixates eccentrically. The fovea is at the black arrow, but he fixates at the intersection of the horizontal fuschia line and vertical turquoise line. The line scan shows that the fovea is atrophic (red arrow). The nasal macula where he fixates (turquoise arrow) has outer nuclear layer cysts.